Setareh Ahmadi is an 11-year-old girl who is the only survivor of a family of six killed in the devastating earthquake that struck Sarpol-e Zahab in Iran’s western Kermanshah province and killed over 600 people. The promise that the chief of the Iranian Red Crescent Society (IRCS) gave last year has come true on the first anniversary of the quake, a report by Shahrvand daily said. 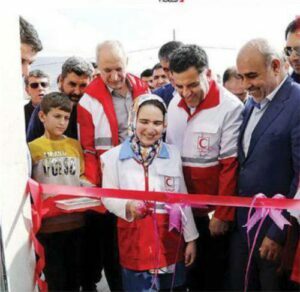 One year ago when Dr Ali-Asghar Peyvandi, the head of the Iranian Red Crescent Society, visited the quake-hit areas and saw for himself the tents set up for the quake victims and saw first-hand the situation of the people, he met a calm, young girl. On the night of the earthquake, she had stayed in her aunt’s home where her family members had a get-together. She had stayed in Sarpol-e Zahab and the rest of her family had returned to Nooshirvan. 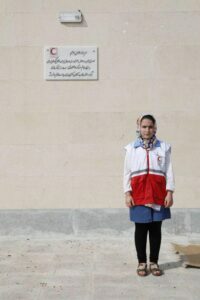 Now, the only survivor of a family of six was standing in front of the director of the country’s Red Crescent Society. “I don’t want a doll. I don’t even want a conex box. I want a house … in the same land that my father wanted to build one where we were going to live,” she said. It was a year ago, exactly the early days after the quake. “A patient and resistant girl like you has every right to make such a demand,” Peyvandi had told her back then. “I know you are in agony. I think even if I were you, I wouldn’t be brave enough to talk. It is not the Red Crescent’s responsibility to construct houses, but I promise you to build a house in the same place where your father’s house once stood …, so that you would always remember them and finally become an honour for the country,” he said. Now, the dream of Setareh’s family has been fulfilled on the anniversary of the earthquake by the very same person who had promised to do so. One year has passed since the quake hit, and we miss all of her family members.